The Wu-Tang Clan sign language interpreter: How Holly Maniatty learned to sign for rappers. How Do You Say Shaolin in Sign Language? Meet the interpreter who has signed for the Wu-Tang Clan, Killer Mike, and the Beastie Boys. 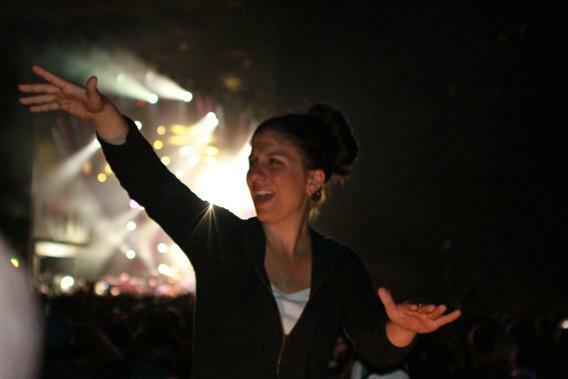 Holly Maniatty signs at a Phish concert. When Killer Mike took the stage last week at the Bonnaroo music festival, he spotted amid the crowd a white woman rapping along to his lyrics, shaking her body and contorting her face to the beat. The Atlanta rapper has his share of white, female fans, but he quickly realized this woman was different: Holly Maniatty wasn’t, in fact, a fan, but a sign language interpreter. Intrigued by her work, the rapper jumped down from the stage to the raised platform Maniatty shared with a colleague and started dancing with them. Curious just how far he could push his interpreter, he rapped every dirty word he could think of on the spot, picking up the speed of his flow to see if Maniatty could keep pace. Earlier this week, a clip of Maniatty signing at the Wu-Tang Clan’s show at Bonnaroo surfaced and quickly went viral. Jimmy Kimmel showed the clip during his monologue. Like Killer Mike, many people had never seen a sign language interpreter translate hip-hop in real time. But Maniatty has been at this for 13 years, using her skills as an interpreter—and careful research of her subjects—to bring music to the deaf. Growing up in Newport, Vt., just south of the Canadian border, Maniatty’s only exposure to hip-hop was through MTV. She’d heard of Snoop Dogg, Puffy, and Biggie, but that was about the limit of her knowledge. She always had a knack for language, and on a whim, applied to the Rochester Institute of Technology’s ASL program. Only one of two students who had no prior sign language experience, Maniatty graduated from the program after two years and later got her undergraduate degree from the University of Rochester. In college she was exposed to a wider range of hip-hop, hearing the Beastie Boys and Wu-Tang for the first time. She loved both. “He looked at me and said, ‘What? You’re going to be interpreting the show?’ ” she says. Signing a rap show requires more than just literal translation. Maniatty has to describe events, interpret context, and tell a story. Often, she is speaking two languages simultaneously, one with her hands and one with her mouth, as she’ll sometimes rap along with the artists as well. When a rapper recently described a run-in with Tupac, Maniatty rapped along while making the sign for hologram, so deaf fans would know the reference was to Tupac’s holographic cameo at Coachella, not some figment of the rapper’s imagination. Maniatty, a first-degree black belt in taekwondo, also conveys meaning with her body, attempting to give her signs the same impact as the rapper’s spoken words. Before interpreting Eminem, she watched videos of how he holds himself while performing, and tried to capture his motions in her work. This is also Maniatty’s approach to an even more delicate term: the N-word. It’s a dilemma for interpreters, especially white ones. But Maniatty says she believes it’s her job to best represent the musicians, and she always uses the sign for the term, and, though she tries to avoid it, will occasionally say it with her lips as well. “It’s very clear it’s the artists’ words, not mine,” she reiterated.